Mill House Fishing Club has been based on the River Ebro in Mora La Nova, Catalonia, Spain for 13 years. 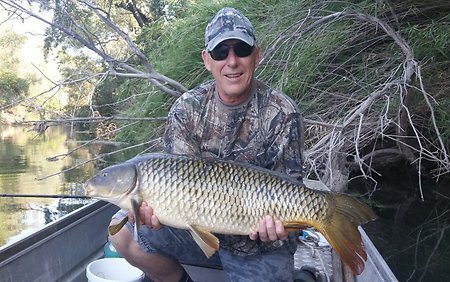 We offer friendly guided catfish and carp fishing in Spain, for all abilities, on secluded river banks and in a peaceful, sunny location. Catfish and carp populations in the River Ebro are plentiful, with our biggest catch on record being 132lbs! We have a number of prime fishing locations (away from the crowds) to choose from, as well as a boat to take you on river excursions. Do not worry if you have never fished before as the owner can be there to guide you. Above is our new record 132lb. Which was caught from our main swim. Wayne had earlier caught a 44lb, then a 77lb and finally a 86lb. I'm thinking of taking the rods off of him so everybody has a chance to catch some! The equipment you will be using has been found to be the best for targeting the fish in this stretch of the river. 2 x catfishing rods with large Shimano baitrunner reels with line to suit or 2 x ESP Paragon rods with Shimano carp baitrunner reels with line to suit, or one of each. Only two rods per person as per the fishing licence. Licence already obtained by us. We recommend the use of Coppins International 20mm halibutt pellets and/or Coppins 20mm krill pellets. Both available on site. Contact us directly for prices and availability. We offer advice on accomodation, which can be found on-site and are here to guide you when your here as much or as little as required. For returning guests we offer the same services and standards as of previous years. 53 Wels catfish over 50lb. Including 8 x 70lbs+, 8 x 80lbs+, 3 x 90lbs+ and 2 x 100lbs+. 15 Carp 25lb and over. Including 9 x 20lbs+, 5 x 30lbs+ and a 37lbs. (Cats are driving out the carp). 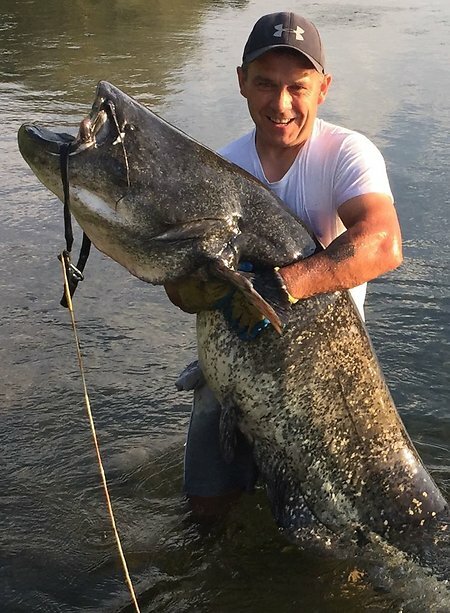 47 Wels catfish over 50lb. Including 6 x 80lbs plus, 1 x 90lbs plus and the 132lbs. 12 Carp 25lb and over. Including 6 x 30lbs plus. (more people fishing for the catfish last year). 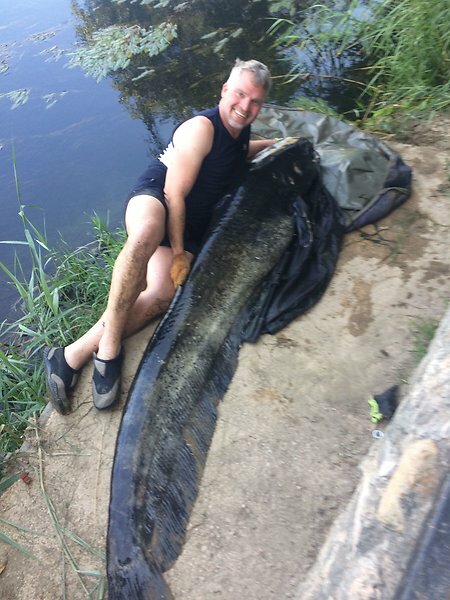 37 Wels catfish over 50lb. 21 Carp 25lb and over. 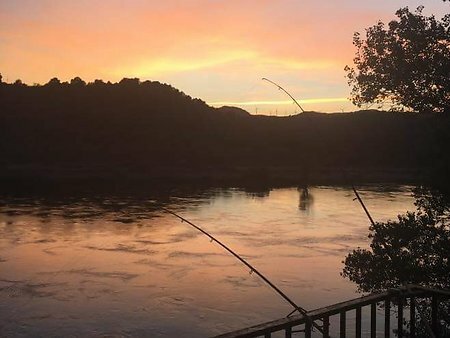 If the strain of fishing from our pegs on the river gets too much, you can use our private swimming pool and sun loungers or relax on the balcony overlooking the River Ebro from the river house. Here is the largest carp caught from our swims. It was caught from the wood swim and weighed in at 48lb. Went out with Brian for a short fish on the river. We manged to catch this monster. Two metres in length and approx 130lb in weight. Took Stan out on the boat for a carp. Here is his immaculate 28lb. 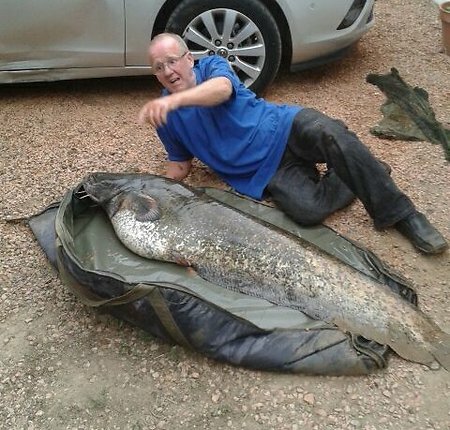 Mick and his wels catfish pb of 90lb. 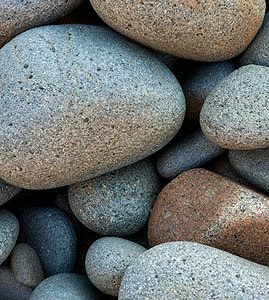 Couldn't resist this picture and then relax. Just a couple of beers missing. If its not the catfish or commerants eating the carp , its a grass snake. (Non poisonous). The new canoes are here.